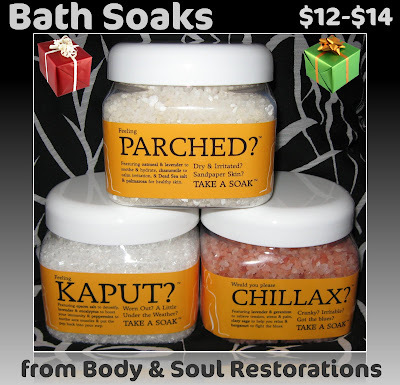 Before I discuss these, let me mention that no, I did not start a bath soak business! I was contacted by the lovely Barbara Lynn who asked if I'd be interested in trying her products, and we just happen to have similar names! 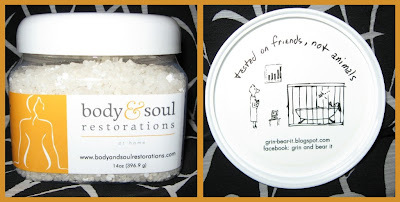 One of my favorite gifts to both give and receive involve bath and body products that make you feel pampered. 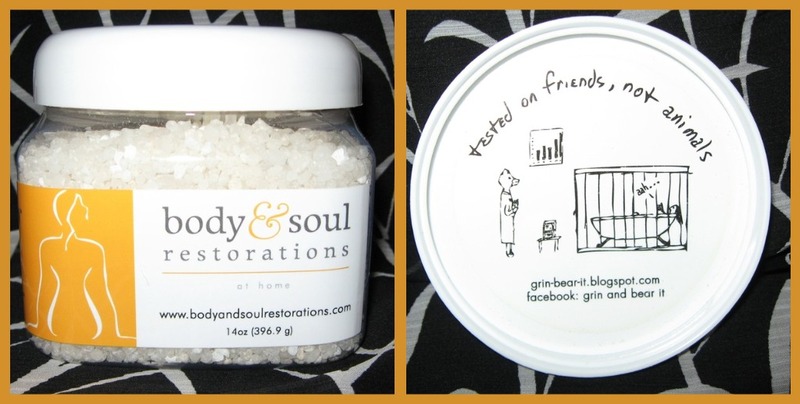 Body & Soul Restorations Bath Soaks are a perfect choice for that. I personally am more of a shower person, but every now again I like to indulge in a relaxing bath. These soaks also work great as hand and foot soaks if you'd like to give yourself a home mani/pedi spa treatment. The bath soaks are 100% natural and include essential oils for a very relaxing, aromatic, and softening experience. How well do they work? Very well! They smell divine--the scent is quite strong in the jar, but they are not at all overpowering during use or after on the skin--and they soften my skin enough that I don't feel the need to use moisturizer when I'm done, which is very rare. I love, love, love using these for a hand and foot soak. I can actually see the difference in my skin long after I've bathed or soaked my hands and feet. I'm always drawn in by packaging, and the labels on these are both informative and humorous. I love the inside of the lid's description on testing! They come packaged in convenient plastic 14 oz. sized jars with a complete ingredient list. Each scent is therapeutic and formulated to target different health and skin concerns. CHILLAX? : features lavender & geranium to relieve tension, stress & pain, Clary sage to help you relax & bergamot to fight the blues. $14.00. KAPUT? : features Epsom salt to detoxify, lavender & eucalyptus to boost your immunity & peppermint to soothe sore muscles & put the pep back into your step. $12.00. PARCHED? : features oatmeal & lavender to soothe & hydrate, chamomile to calm irritation & Dead Sea salt & palmarosa for healthy skin. $12.00. Barbara Lynn is passionate about her work and her products, and she has a spa located in Hastings-on-Hudson in Westchester County, outside of New York City. She's a licensed aesthetician and a graduate of the Aveda Institute. She enjoys teaching clients how to fight stress and disease through the use of botanicals and minerals, and utilizes the Eastern tradition to accomplish this with both her practice and her products. You can find her on Facebook and on Twitter if you're interested in learning more.